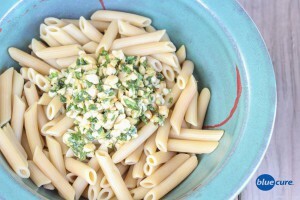 Pesto can be quick and easy to make without even having to use a blender! 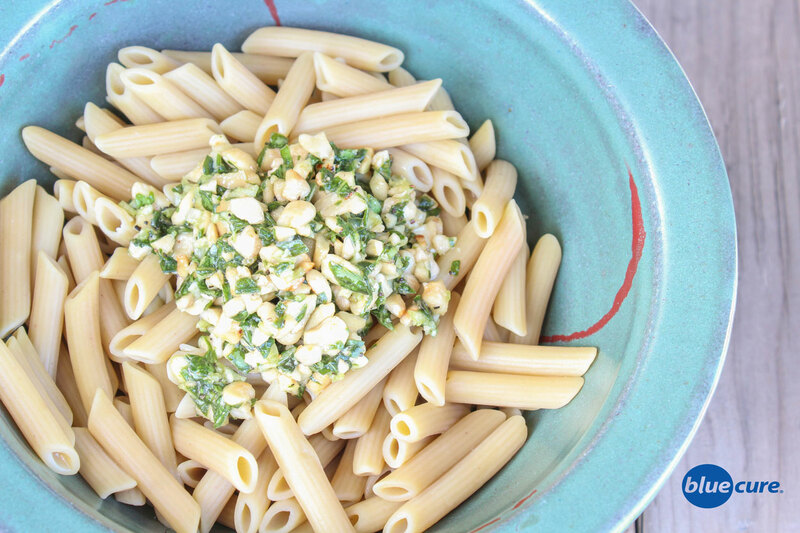 The crunchy texture of this pesto is sure to jazz- up your normal pasta routine. Pair it with lentil or bean pasta noodles to get more protein than regular or whole wheat noodles; a perfect option for people looking to eat more plant-based meal and incorporate more beans into their diet. Cook pasta according to instructions on box. Drain and set aside. Toast the nuts (unless already using toasted nuts) in a large dry, non-stick pan. Heat pan on medium-high and add nuts, stirring constantly for 3-5 minutes until lightly golden and you can smell the aroma of the nuts. Set aside in bowl. Chop basil and garlic and place in bowl, add oil and pepper and salt. Stir well and add over cooked pasta. Serve with sautéed vegetables or a big leafy green salad. Enjoy! Option to add cashew cream to this to make it extra creamy!